Here, in Usantini Moving & Storage, we pride ourselves in being the most trusted moving and storage company in Brooklyn. As a fact, our clients have put their trust in us for more than eighty years… continue to demonstrate our commitment to them by delivering the highest quality of Moving and Storage services in Brooklyn and all of the other New York City boroughs. USantini Moving and storage pride itself on providing the most comprehensive and innovative moving, relocation and storage services in Brooklyn and the rest of the NYC area. Moving is difficult, but selecting the right mover is all about finding trusted professionals you can count on. Usantini Moving and storage is offering a highly customizable type of service. We work with our clients in order to understand their challenge and provide a customized type of moving and storage service to fit their needs. Whether you are moving a few large items, live in an apartment, condominium or own a home. Usantini Moving & Storage is a trusted moving and storage company that is fully licensed, bonded and insured relocation company with more than eighty years of experience in moving people such as yourself within Brooklyn, Manhattan, Queens, the Bronx and Staten Island. If you need to move in New York city or anywhere in the US for that matter don’t hesitate and call Usantini Moving and storage at 718-768-6778. Usaniti Moving and storage relocation consultants will be happy to schedule a FREE estimate in your home and provide you with the best advice possible on how to make your move more efficient and cost effective. You can also hit our website at https://usantini.com and fill the form on the right in order to receive an estimate. You can also read about our clients testemonials, and history. Make sure that you request our coupon for $100 off your move if you do choose to move with USantini Moving and storage. Don’t forget, Moving might be hard and unpleasant, but choosing a trusted Moving company in Brooklyn is easy. Just call 718-768-6778 and let the veterans of Usantini Moving and storage guide you to a successful moving experience. Usantini Moving and storage is a Brooklyn-based local moving company, serving Brooklyn, Queens, New York City, Staten Island, Bronx, Long Island, New Jersey and the entire East Coast. Our profession, courteous and efficient movers will save you time and money offering great service for Your Brooklyn move. USantini moving and storage company has been helping our valued customers in Brooklyn, Queens, Long Island, Manhattan and the entire New York Metropolitan area. USantini Movers has been around for more than eighty years and have successfully overcome every moving challenge in Brooklyn and New York’s other boroughs. We have great relationship with our clients and most of our business growth is driven by word of mouth. Our clients recommend our services to their friends and family and many stay with consider us their exclusive source for moving and storage services in Brooklyn. Not sure what you need to do before your move to Brooklyn? Don’t hesitate calling USantini Moving and storage and consult with our relocation consultants before starting your move preparations. Usantini Moving and storage relocation consultants will provide great, money saving advice in preparation for your move. Usantini estimators performed thousands of estimates in Brooklyn, Queens, Manhattan, the Bronx and Staten Islands. We pride ourselves on the accuracy of our estimates and our A rating with the better business bureau is a testimonial to the quality of our estimates and service. USantini Moving and storage representative will come to your home and and look at the items you want moved. This will assist us in coming up with a more accurate quote on the cost of your Brooklyn move. It’s good if we can do the estimate at least three weeks before your move date, so you get a good sense of what you can and should do in order to reduce the price of the move and get a chance to speak to other movers and compare the services offered by different moving organizations. USantini Moving and Storage has been operating in its Park Slope, Brooklyn offices for more than eighty years. If you leave Brooklyn and are looking for a mover, ask your friends and family abut us, chances are that some of them already moved with us. Or better, check our better business bureau ratings. We are proud of our A rating. Need to move soon? Check our our coupon for $80 worth of FREE boxes. We will deliver the boxes to your home for FREE also. Call us today at 718-768-6778 to schedule your estimate and ask for your FREE boxes. How to choose a reputable Mover in New York City? – The estimate should be based on an actual inspection of your household goods. – For moves from one State to another, a U.S. DOT number is issued by FMCSA. You can double-check a mover’s license on www.protectyourmove.gov. For moves within a State, requirements vary. Check with your State, county or local consumer affairs agency or your State attorney general. Remember your priorities when choosing a mover. If you hire a mover based solely on the cheapest price, you may be sacrificing other things that are actually more important, such as getting your possessions moved and delivered on time. And remember, movers are required by law to deliver your goods for no more than ten percent above the price of a non-binding estimate. This is known as the 110 percent rule. Do your homework. Read “Your Rights and Responsibilities When You Move,” a booklet from the Federal government that your mover is required to give you if you are moving from one State to another. This booklet also has information you’ll need if your goods are lost or damaged during the move. Finally, check the mover’s complaint history with local consumer advocacy organizations, such as the Better Business Bureau. Movers that do not have a website. – Most companies have websites that list their services, service history, destinations they will move to, and roughly how much it will cost. This is a great place to get background information and to start compiling a list of potential companies. Also, most companies will list contact information, including e-mail addresses, allowing you to ask questions and be provided with a written response. The mover doesn’t offer or agree to an on-site inspection of your household goods and gives an estimate over the phone or Internet—sight-unseen. If these estimates sound too good-to-be-true. They usually are. Insist on a house visit for your move. The moving company demands a large amount of cash or a large credit card deposit before your move. These types of companies probably suffer from a large number of pre-move cancellations. Avoid these kinds of companies. The company has a website but the website has no local address and no information about licensing or insurance. The moving company does not offer insurance and claims that all of your goods are covered by their insurance. When you call the mover, the telephone is answered with a generic “Movers” or “Moving company,” rather than the company’s name. These are probably lead brokers who harvest moving leads are sell them to moving companies. They are not movers and might expose you to numerous disreputable moving companies that will call you day and night and promise the world in order to get your business. Avoid these kinds of establishments. The most important thing about finding a good moving company is to “do your homework”. Ask your friends and family who they moved with, find a company that your friends and family liked working with. Check its credentials with local and federal authorities and get a written estimate for your move. If you have further questions about hiring a good mover, Call U.Sanitni Moving and storage at 718-768-6778 and we will be happy to answer all of your questions. Welcome to your new house! Now it is time to give it that special individual touch, so it will feel like your home. For the past 83 years U. Santini, a full service moving company in Brooklyn, has been helping people move and feel comfortable in their new homes. Moving, in itself can be stressful, but moving in Brooklyn, Manhattan, well New York City, in general, takes it to a whole new level, as space here is VERY limited, and spacious apartments are rare luxuries. Usantini is one of the most trusted moving and storage companies in New York City. If you are looking for a Brooklyn mover, or just for some moving services in Brooklyn – Don’t hesitate to call us at 718-768-6778 and our sales team will be happy to discuss your coming moving and storage needs. Here are 12 tips that we have used time and again, to help you to start organizing your new place in a very efficient manner that is easy to maintain. Consider using these tips unless you intend to get a storage unit in Manhattan or Brooklyn. Use pretty baskets, mason jars and boxes to contain bathroom clutter and toiletries. Lotions, razors, hair spray, etc. can easily be placed under the counter. They will be out of sight but easy to reach and use. Keep bath items in the tub/shower area by hanging an organizer over the shower head or in the corner of the tub. These are inexpensive and easy to use. Use decorative baskets or magazine racks for reading materials. These also are handy to store television remotes, tissues and other items out of sight. Use pants hangers to store boots. Simply clip the top of the boots and hang in the closet where they are accessible but out of the way. Install hooks or use over the doors hooks to keep coats, towels, robes and the like organized. Consider hanging a shoe organizer over the back of a door and fill it with cosmetics. Clothing should be sorted by season and items not being used can be sealed in vacuum bags. They will take up less room and will be safe from mildew and moths. This works well for extra comforters, quilts and blankets also. 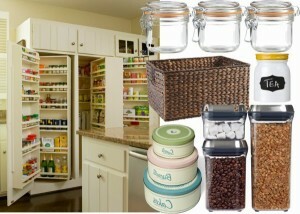 Clear bins, totes and tubs are great for organizing a room, an entire home or a garage. They allow the contents to be easily identified and stack to conserve space. Install pegboard in the kitchen, kid’s rooms or just about anywhere. Utilize these to hang items so they are off the floor or counters and easily retrieved. Use chalkboard paint to create a bulletin board on a door or wall. Write family activities, daily chores, schedules and other information on it so everyone can see and know what is happening each day. Install a tension rod under the kitchen sink and in cabinets. There are no tools required and they are easily removed. Use these to hang cleaning products, set spices on them or to stack plates. Install a magnetic rack in the kitchen to hold knives and other sharp utensils. They will be out of the way and children cannot reach them. Use the same idea in the garage. These are just a few ideas to get you started in your new home. Since we are movers and packers, full service movers, business movers and experienced in every area of moving and storage, we can answer questions. We fulfill your every need for movers in NYC or anywhere. We offer packing services, move a small apartment or can move an entire business. We are available for New York moving and storage or will customize services to suit your every need. Come by our office or call us at (718)768-6778 to receive exceptional customer service or just to get more helpful hints for organizing your home.